Late in 1938 an expedition was undertaken to evaluate certain British islands in the South Pacific for their suitability for aviation operations, both the construction of airfields and the use of lagoons by flying boats. E.W. Lee was third in command of the expedition, and was in charge of the survey at Gardner Island. 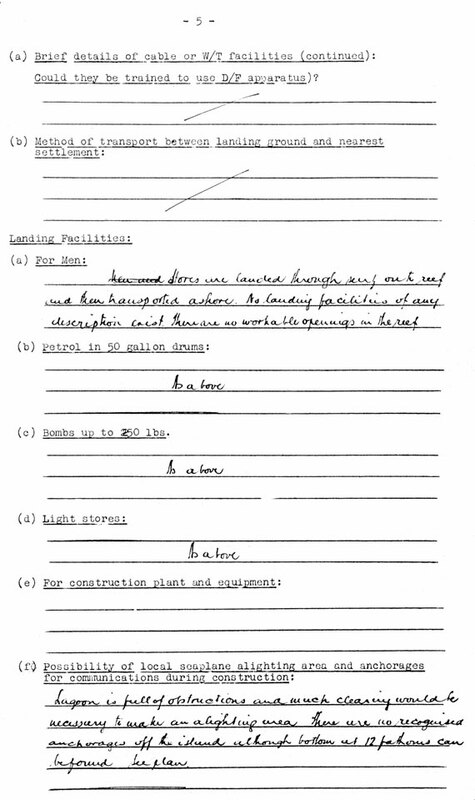 This is his report, in two forms: the original hand-written form he filled out, and the narrative report. The thumbnails below are links to JPEG images of our copies of the original reports. Click on each image to view the larger version in a new window. 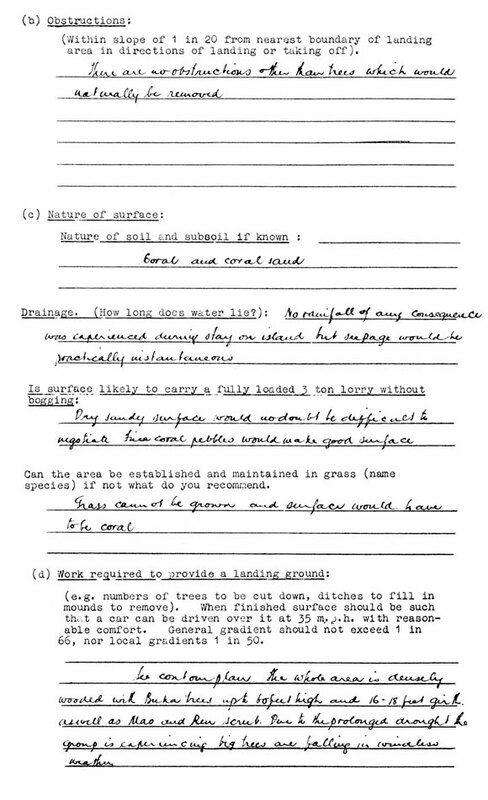 Below these links are transcriptions of the text of the reports for easier reading. I have to report that, leaving Suva on the 24th November, 1938, at 5.45p.m. per the chartered vessel M.V. 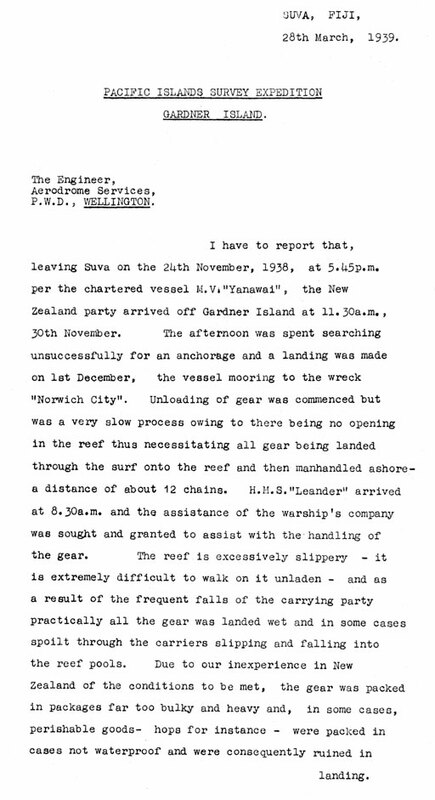 Yanawai, the New Zealand party arrived off Gardner Island at 11.30a.m., 30th November. The afternoon was spent searching unsuccessfully for an anchorage and a landing was made on lst December, the vessel mooring to the wreck Norwich City. Unloading of gear was commenced but was a very slow process owing to there being no opening in the reef thus necessitating all gear being landed through the surf onto the reef and then manhandled ashore a distance of about 12 chains. H.M.S. Leander arrived at 8.30a.m. and the assistance of the warship’s company was sought and granted to assist with the handling of the gear. The reef is excessively slippery – it is extremely difficult to walk on it unladen – and as a result of the frequent falls of the carrying party practically all the gear was landed wet and in some cases spoilt through the carriers slipping and falling into the reef pools. Due to our inexperience in New Zealand of the conditions to be met, the gear was packed in packages far too bulky and heavy and, in some cases, perishable goods – hops for instance – were packed in cases not waterproof and were consequently ruined in landing. For the information of any further expeditions I consider that all gear and stores possible should be packed in 4 gallon tins and well soldered. For ease of handling all packages should be kept as much as possible to such dimensions and weights that one man can quite easily carry the package. 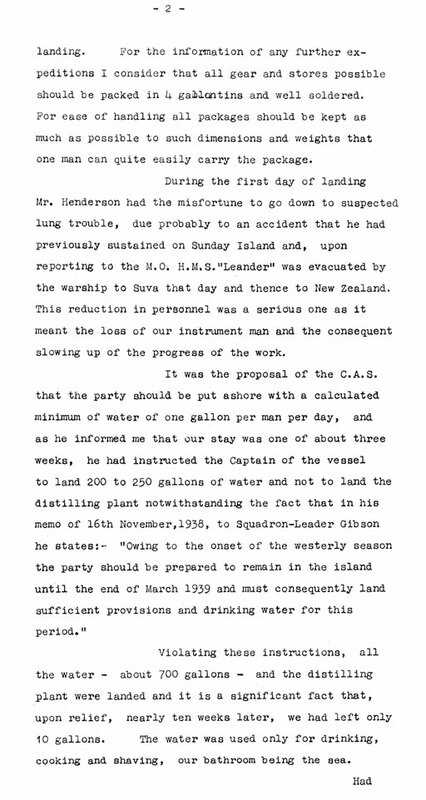 During the first day of landing Mr. Henderson had the misfortune to go down to suspected lung trouble, due probably to an accident that he had previously sustained on Sunday Island and, upon reporting to the M.O. H.M.S. Leander was evacuated by the warship to Suva that day and thence to New Zealand. This reduction in personnel was a serious one as it meant the loss of our instrument man and the consequent slowing up of the progress of the work. Violating these instructions, all the water – about 700 gallons – and the distilling plant were landed and it is a significant fact that, upon relief, nearly ten weeks later, we had left only 10 gallons. The water was used only for drinking, cooking and shaving, our bathroom being the sea. Had the instructions been carried out as laid down, the lives of the party might possibly have been endangered if not sacrificed. Two showers of rain were experienced during the stay, neither of any consequence and water from wells is not only scanty but absolutely undrinkable by Europeans. In this connection, I would point out that from the arrival of the Gilbertese settlers on 21st December until our departure, thirty-three wells were dug by the colonists of which only two were usable by them – the water was brackish and totally unfit for European consumption. Unloading of the gear was finally completed on the 6th December and the ship left the island that day. By this time the camp had been pitched and survey work started on 8th December. For the first fortnight all the party found the excessive heat almost impossible to work in and the first work, which consisted of cutting stadia lines through the bush, was carried out in sweltering heat – up to 120 degrees – at a consequently slow rate of progress. After this period of acclimatization however better progress was made though the heat remained practically constant. Sickness fortunately was experienced to a minimum degree – one case of stomach trouble and a few cases of excessive sunburn – all of which were soon remedied and caused little inconvenience. On the 21st December the Gilbert and Ellice Islands Administration’s vessel Niminoa [sic] with Messrs. Maude and Gallagher and a party of colonists for Gardner Hull and Sydney Islands arrived and a pioneering party of 10 adult males was left on Gardner Island to inaugurate the settlement scheme. The survey work consisted of traversing traversing an area of about 200 acres at the northwestern corner of the island and stadia profiles were taken at five chain intervals from which a contour plan has been prepared. The lagoon and later the coast were traversed and a plan of the entire island has been prepared in accordance with the instructions left by the C.A.S. Upon completion of the preliminary investigations on the aerodrome site, runways were buoyed in the lagoon in water clear of obstructions with a minimum depth of 2 fathoms – the average depth of the lagoon being 3 – 4 fathoms. 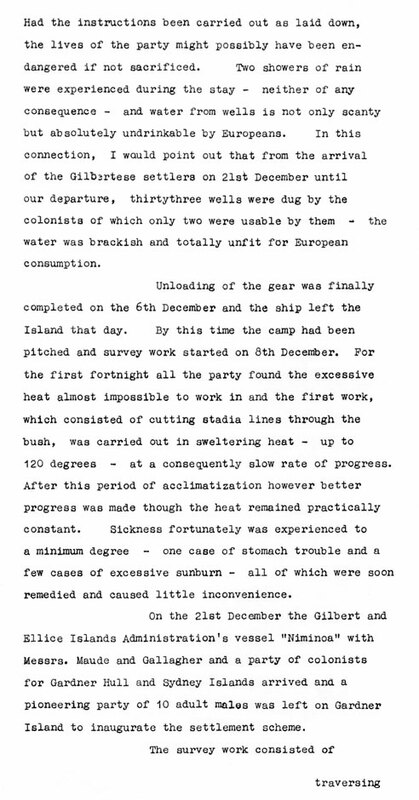 It was for us a fortunate circumstance that the relief ship was put into quarantine as we were thus enabled to complete the field work which must otherwise have been left incomplete. No actual westerly weather was encountered during our stay on the island but exceptional westerly swells were experienced during the first week of the new year reaching their peak on 8th January when they reached a level of 4 feet above the ordinary spring tide of 6th December. Due to the restricted opening to the lagoon these swells had very little effect on the lagoon the tidal range of which is approximately 2 feet. 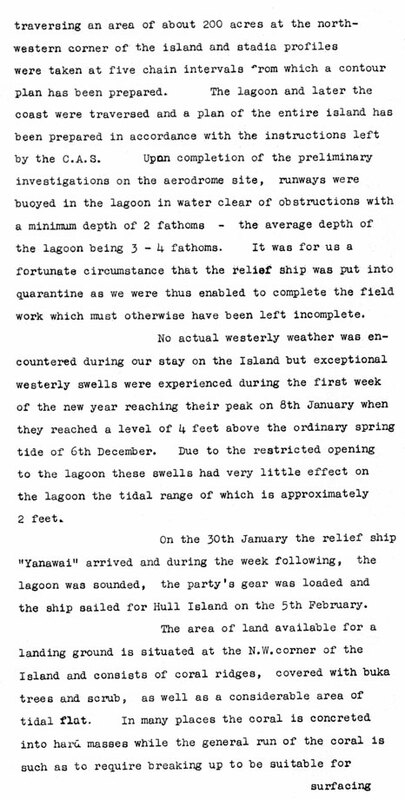 On the 30th January the relief ship Yanawai arrived and during the week following, the lagoon was sounded, the party’s gear was loaded and the ship sailed for Hull Island on the 5th February. The area of land available for a landing ground is situated at the N.W. corner of the island and consists of coral ridges, covered with buka trees and scrub, as well as a considerable area of tidal flat. In many places the coral is concreted into hard masses while the general run of the coral is such as to require breaking up to be suitable for surfacing. As fire is necessary to break up the coral it might be necessary to practically denude the island to provide sufficient fuel to achieve this end. 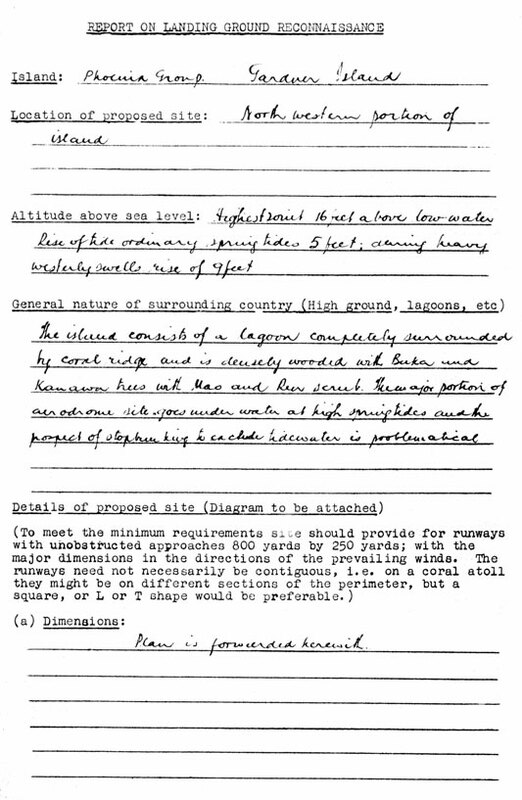 As it would be necessary to preserve the high coral ridge towards the sea, the landing ground would be practically subtidal and the possibility of stopbanking to exclude tidewater would be problematical due to the presence of and the apparently unceasing excavating activities of the myriads of land crabs which dig holes 6 – 8 inches in diameter and leave spoil heaps 10 – 12 inches in height. This would also introduce an item of constant surface maintenance if a landing ground were constructed. The lagoon is long and narrow and thus does not present a very suitable proposition as a sea alighting area although the length is somewhat in the direction of the winds prevailing during our stay. The western end or the lagoon might possibly be used in other directions but the available runs are very restricted. There are numerous coral patches of varying sizes in the lagoon, the greater number of them being shoals – not pinnacles – which call for dredging as it is not possible to get underneath them with explosives as it is in the case of pinnacles. 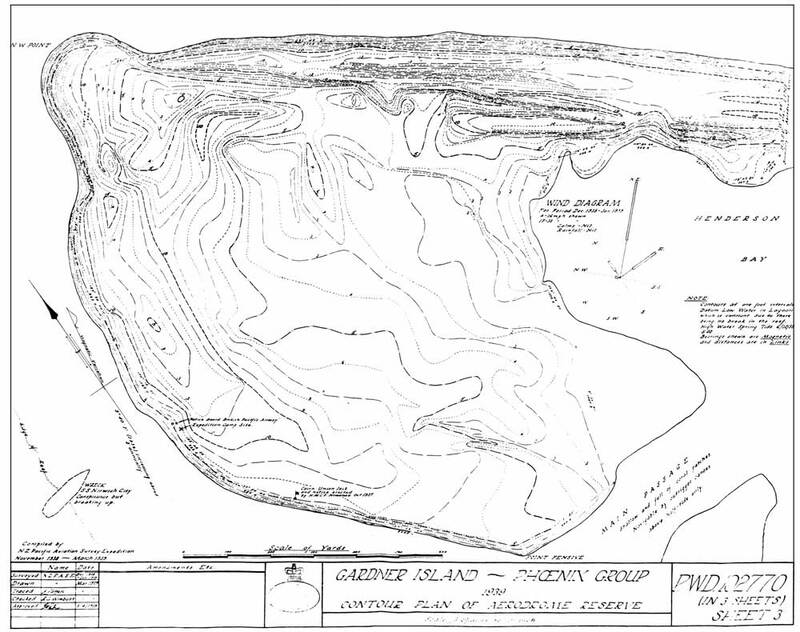 In conclusion, I do not consider that Gardner Island holds sufficient possibilities to recommend it either as a land or a sea alighting area. Location of proposed site: North western portion of island. Altitude above sea level: Highest point 16 feet above low water. Rise of tide ordinary spring tides 5 feet; during heavy westerly swells rise of 9 feet. General nature of surrounding country (High Ground,_lagoons, etc. The island consists of a lagoon completely surrounded by coral ridge and is densely wooded with Buka and Kanawa trees with Mao and Ren scrub. The major portion of aerodrome site goes under water at high spring tides and the prospect of stopbunking to exclude tidewater is problematical. (Within slope of 1 in 20 from nearest boundary of landing area in directions of landing or taking off). There are no obstructions other than trees which would naturally be removed. 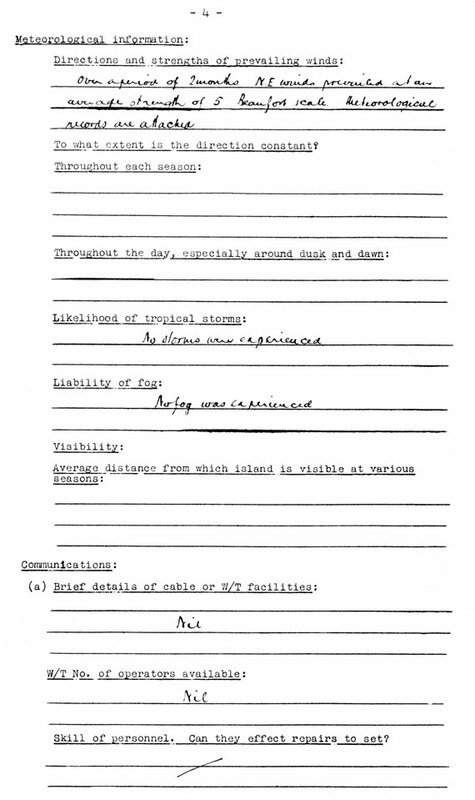 No rainfall of any consequence was experienced during stay on island but seepage would be practically instantaneous. Dry sandy surface would no doubt be difficult to negotiate. Fine coral pebbles would make good surface. Can the area be established and maintained in grass (name species) if not what do you recommend. Grass cannot be grown and surface would have to be coral. (e.g. numbers of trees to be cut down, ditches to fill in, mounds to remove). When finished surface should be such that a car can be driven over it at 35 m.p.h. with reasonable comfort. General gradient should not exceed 1 in 6 6, nor local gradients 1 in 50.
Who owns the land (e.g. Crown – Native Owners)? Crown, the Gilbert and Ellice Island Administration are settling colonists on the island but aerodrome reserve has been reserved from settlement activities. 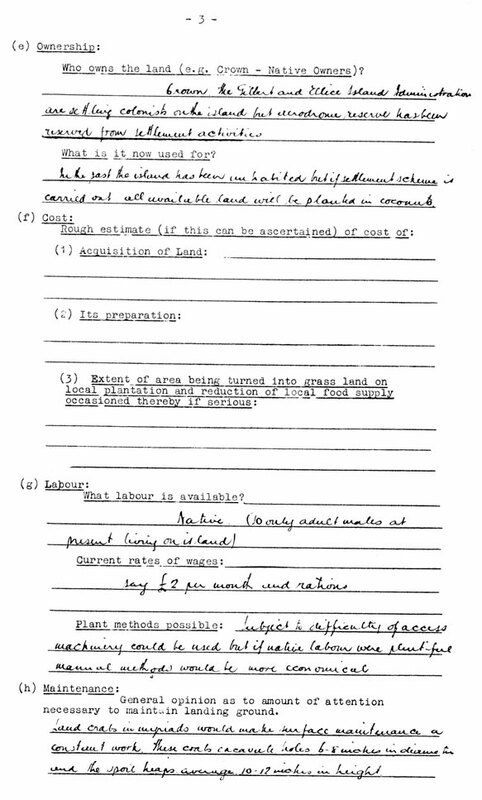 In the past the island has been unhabited [sic] but if settlement scheme is carried out all available land will be planted in coconuts. Say £2 per month and rations. Subject to difficulty of access machinery could be used but if native labour were plentiful manual methods would be more economical. General opinion as to amount of attention necessary to maintain landing ground. Land crabs in myriads would make surface maintenance a constant work. These crabs excavate holes 6-8 inches in diameter and the spoil heaps average 10-12 inches in height. Over a period of 2 months NE winds prevailed at an average strength of 5 Beaufort scale. Meteorological records are attached. To what extent is the direction constant? Skill of personnel. Can they effect repairs to set? Could they be trained to use D/F apparatus )? Stores are landed through surf onto reef and then transported ashore. No landing facilities of any description exist. There are no workable openings in the reef. (c) Bombs up to 250 lbs. Lagoon is full of obstructions and much clearing would be necessary to make an alighting area. There are no recognised anchorages off the island although bottom at 12 fathoms can be found. See plan. Any armed police or local forces? 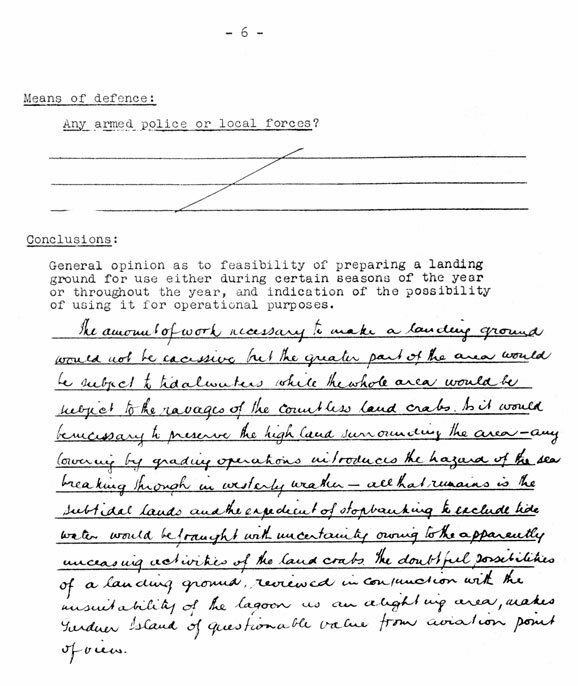 General opinion as to feasibility of preparing a landing ground for use either during certain seasons of the year or throughout the year, and indication of the possibility of using it for operational purposes. The amount of work necessary to make a landing ground would not be excessive but the greater part of the area would be subject to tidal waters while the whole area would be subject to the ravages of the countless land crabs. As it would be necessary to preserve the high land surrounding the area – any lowering by grading operations introduces the hazard of the sea breaking through in westerly weather – all that remains is the subtidal lands and the expedient of stopbanking to exclude tide water would be fraught with uncertainty owing to the apparently unceasing activities of the land crabs. The doubtful possibilities of a landing ground, reviewed in conjunction with the unsuitability of the lagoon as an alighting area, makes Gardner Island of questionable value from aviation point of view.